Another show in the musical genre was To Your Good Health, though you wouldn't necessarily know it was a music show from the name. The name comes from the sponsor, E.R. 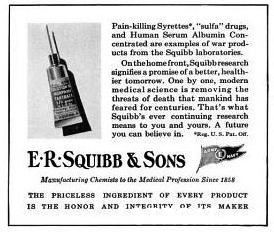 Squibb and Sons, "manufacturing chemists to the medical profession". The Squibb Orchestra and Squibb Chorus were directed by Lyn Murrary, a very respected musical director. Murray hosted, scheduled and arranged all of the music for the show. To Your Good Health debuted on CBS 1943 and was considered to be one of the finest music programs on the radio at the time. That reputation was a result of Murray's control over the series and ability to select just the right type of music and match it to the right type of singer. Be the first to comment on "To Your Good Health"